Discussion in 'Amps and Cabs' started by katarzis, Jul 20, 2008. G12M 25W vs G12H 30W - please compare. Here is my understanding that the G12m or greenback was designed for guitar. The G12H had a green back but used a bass cone. I don know if the speaker was intended for bass guitar use. The G12M is often described as woody. It is definately a speaker that is voiced with a midrange hump. The G12H has a more of a scoop in the EQ. It gives you nice highs and lows with less midrange. My favorite all around speaker combination is a G12M and a G12H mix. They are both vintage sounding speakers. Greenback are yummier, especially old ones. These are considered "blackbacks" because they aren't green and they were made after Celestion got bought out by Rola, but they're still british and almost 30 years old. 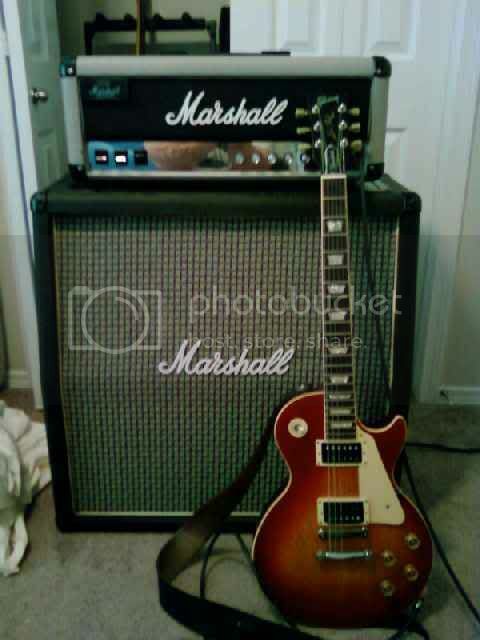 1979 Marshall 1960 Lead cab, hands down my favorite cab I've ever used. Greenbacks are less efficient 96db for Heritage Greenbacks. G12H-30 is 100db. So if you were using your Tiny Terror and wanted big output, get the G12H. If you were using your Rockerverb 50, get the Greenbacks. You should hear them both, but if you can't sample them, to me the Greenback is the ultimate classic rock blues/rock speaker. I love mine with my JTM45, 2204 and Orange Rockerverb 50. Yummy. Greenbacks are more mid-forward with a looser bottom end. do you have it in the Orange PPC212? For dirt, G12M greenbacks record well, but you can forget about spanky cleans because they have cone breakup happening pretty early. IMO, the g12H is a tighter speaker, but I still dig greenbacks for dirt sometimes. I recently switched out my Mesa 3/4 closed back 2x12. I had G12M Heritage and put in a G12H and a V30. I couldn't use my G12M Heritage in my 4x12 Marshall, but I have a quad of the reissue G12M. Loving the tones in both. BTW - I think the Orange cab would sound fantastic, heavy cab but closed backed. I'm finding the Scumback M75 really good for lower volumes due to their earlier breakup. However, with the right amp, they still have decent small to medium venue headroom. I have one in my new Louis Electric Tremblelux. For me, it's the perfect small to medium venue, amp/speaker combination. Tone for miles and miles. For a sample of the Scumback H75 (not M75) listen below. It sounds pretty juicy too. Heavier magnets are generally brighter, stronger, louder. I prefer the M's. If you are looking at trying different speakers with your Orange, I highly recommned the Scumback M75-HP (65 watt vintage greenbacks). After trying nearly 2 dozen speakers, these are the best sounding speakers I've tried. Blow away V30's for clean tones and everything except modern high gain.